Approximately 5000 active members, over 120 groups in 18 countries with 30 Subud houses and two large Subud communities. Zones 1 and 2 consist of countries in Australasia and Asia. While each of the seven zones worldwide is unique, this is certainly true for Zones 1 and 2, which includes a wide range of cultures, economies, beliefs, and numbers of members in each country, not to mention the geographic distances, ranging East and South from New Zealand and West to Iran. One thing of special note is the fact that Subud began here, with the founder, Bapak Muhammad Sumohadiwidjojo, being born in Indonesia in 1901. Today Indonesia has the largest Subud membership in the world and the longest history. Subud was first registered with government officials in 1947 in Jogjakarta. In 2007 approximately 500 Indonesian members along with foreign guests commemorated their 60th anniversary at the World Trade Center in Surabaya. Other countries with well-established organizations are Subud Australia, New Zealand, and Japan. Subud India is thriving. In 2006 a hugely successful international Gathering was held in Bangalore, with attendance from Subud members across the globe. Several international meetings were held at the same time and Ibu Siti Rahayu Wiryohudoyo, Bapak’s daughter, visited and gave talks. Malaysia and Sri Lanka also have long established membership bases, though smaller, while the arrival of Subud in Thailand and elsewhere is more recent. The Convention Center in Christchurch, New Zealand, was the site of the 13th Subud World Congress in January 2010. We are grateful for the vision, dedication, creativity and the plain hard work required in organizing Subud World Congresses, and the New Zealand organizing team stood out in all areas. Add to this the feeling of a relaxed atmosphere, the congress was reported by Subud members the world over as joyous and ‘mature’ and met the diverse needs of a worldwide membership and the business of congress. And as if that weren’t enough for the Christchurch volunteers, they added an addition to their latihan hall, almost doubling the size while planning for the congress.In September 2010 and February and June of 2011 devasting earthquakes struck Christchurch. While all members remained unharmed physically, the devastion to structures, infrastructure and ongoing stress from over 8000 aftershocks have taken their toll. Even the convention center where the congress was held will be torn down. [report below] A successful fundraising appeal from the WSA and SDIA brought in much needed assistance; approximately $75,000 USD including $10,000 donated to local aid organizations. Subud has an impact on and is playing a role in the development of Central Kalimantan through its social activities as well as through various enterprises. It is a hub for the growth of Subud. Two visioning workshops have been held in Rungan Sari, the Subud community outside Palangkarya, the capital city. In 2006 Osanna Vaughn, then WSA Chairlady, began an international dialogue on Kalimantan in the worldwide Subud community to better understand how Subud was contributing to the development there. A 2007report remains relevant and provides much background information. Maya Korzybska writes: The common denominator of those present was their love and/or interest in Kalimantan and its development within the context of Subud and Bapak’s vision. Pak Haryono reminded us that Bapak’s (and our) real mission as he expressed it many times is to re-form civilization and that Kalimantan was a place where this could still be achieved. Some of the projects include the Bina Cita Utama School, the first ‘National Plus’ school in Central Kalimantan, bringing high quality education to students from all backgrounds; Kalimantan Gold Corporation with its related social service foundation, Yayasan Tambuhak Sinta, helping to develop individual and collective capacity in local villages and government; Yayasan Usaha Mulia (YUM), a non-profit involved in social welfare projects such as malaria control, clean water, and micro-credit in Kalimantan; the Rungan Sari development, providing conference facilities surrounded by a community of Subud members, or the eco-tourism company, WOW Borneo to name a few. In 2008 the successful visioning workshop attracted approximately 70 participants from several countries (photo above). The general objective was to bring more energy and support to the pioneering development of the diverse and ground-breaking projects in the area. 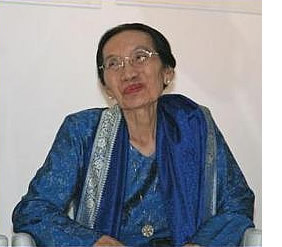 Ibu Rahayu on her 80th Birthday during the opening of Adi Puri as pictured at the top of this page. There are also active members in Bangladesh, Hong Kong, Pakistan, the Philippines, Singapore, Taiwan, and three additional countries. Further Zone contact informations. Zone 1 – 2 communicates for the most part through e-mail and the telephone. The zone council meets approximately bi-annually. It is a financial challenge for certain delegates to attend and there are often visa obstacles to overcome. Subud Ink, Australia Newsletter: Download issues here.